If you’ve always dreamed of playing drums, you’ll know it’s a powerful ambition. But along with the excitement, you may also feel that learning drums is too hard. And yet, while you certainly do have to put in some effort, becoming a tight drummer may not be as tough as you think. If you can tap in time to music, you already have an intuitive understanding of the fundamentals of rhythm...you just need to take the next step. Roland V-Drums are the world’s most popular electronic drums, thanks to their powerful sound, great playing feel and legendary durability. And if you think you might have drumming in your blood, the new V-Drums TD-1DMK will help you find it. The TD-1DMK provides a fulfilling drumming experience in a compact kit that’s easy to move around. 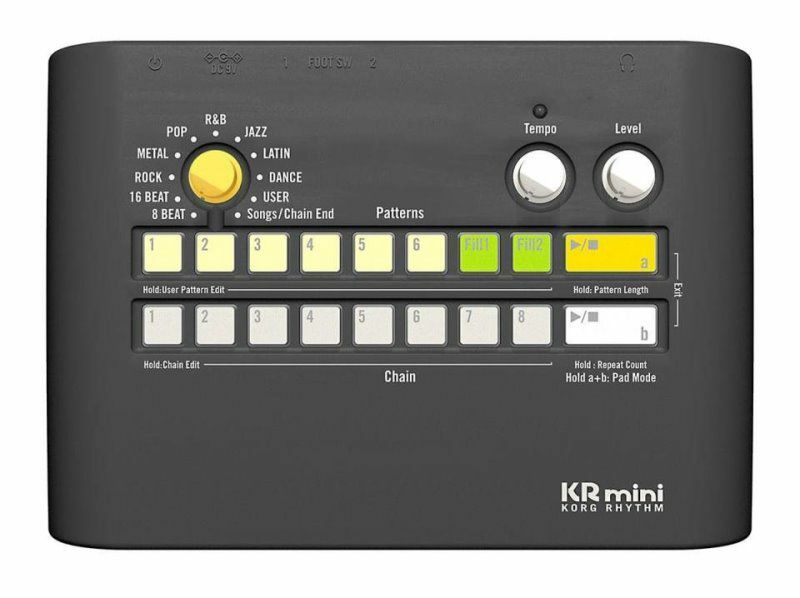 The simple-yet-powerful module includes a variety of expressive drum kits, connected to Roland’s renowned dual-mesh pads for snare and toms which match the feel of playing on acoustic drums but without the noise* – great for late-night practice sessions. You can play with headphones too, so you won’t disturb family or neighbors, and with onboard coach functions and the ability to connect to Melodics drum training software, you’ll be surprised how quickly you’ll improve. Pick up the sticks, take a deep breath and pull up to the TD-1DMK. 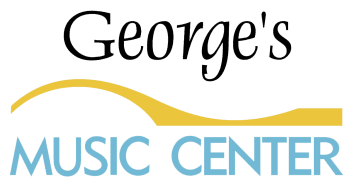 A lifetime of drumming awaits – so what are you waiting for? If you’ve haven’t played drums before, you might think it’ll be too difficult, or that learning on an electronic kit is complicated. 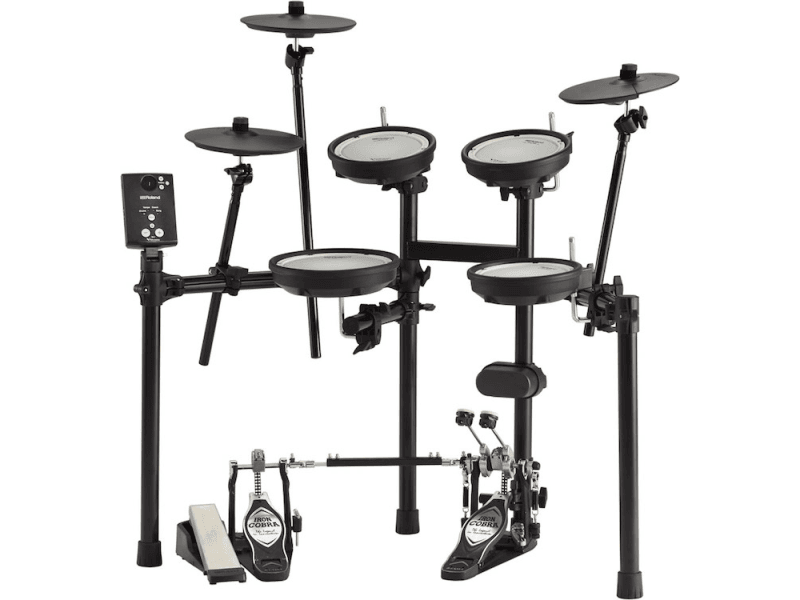 The TD-1DMK is a hassle-free drum kit that’s easy to set up and intuitive to use. Just connect the power, switch on and connect either your headphones or monitor speakers. You’re ready to start playing an authentic-sounding collection of drums, with a choice of 15 preset kits, for a realistic and engaging drumming experience. And when it’s time to start working on your drum skills, onboard coach functions and Melodics for V-Drums software let you learn the essentials and quickly start climbing the ladder. It’s easy to move around in your home too, so whether you’re playing solo or want to perform for your friends and family, the TD-1DMK can go wherever you play. When your child learns a musical instrument, they also learn about life. Along with discipline and determination, the sheer enjoyment they’ll get when playing drums is priceless. Developing accurate timing and keeping a solid beat are fundamental elements of drumming, and the TD-1 module’s onboard metronome and 10 coach functions show your child how their timing skills are improving. The game-like experience of the coaching functions means that although they’re learning, every session is fun and engaging. Melodics for V-Drums, a free application for Windows or Mac computers, provides a series of free drum lessons that help develop a sense of rhythm without it seeming like hard work. 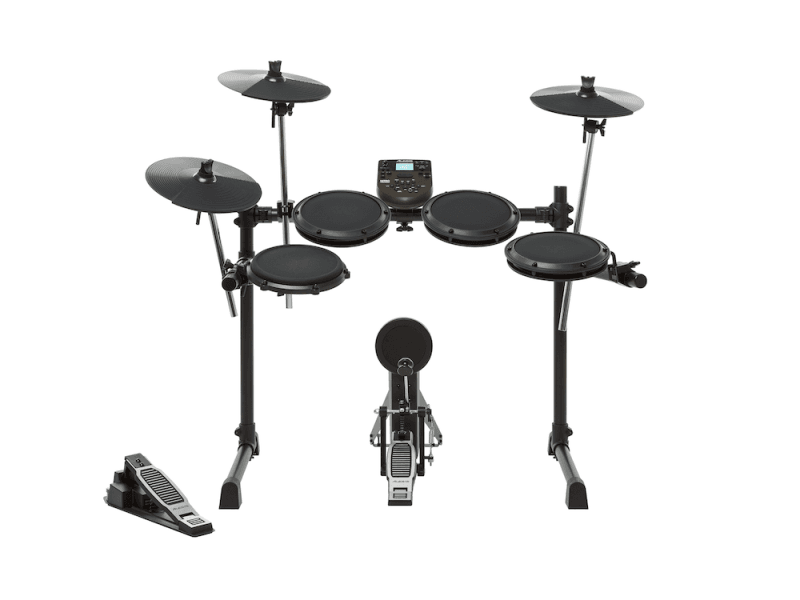 The TD-1DMK’s pads are quieter than other electronic drums too, so your child can practice without limitation. From durable dual-ply mesh heads to a kick drum pad that absorbs the impact of a beater, all V-Drums are built to be noticeably quieter when played*. 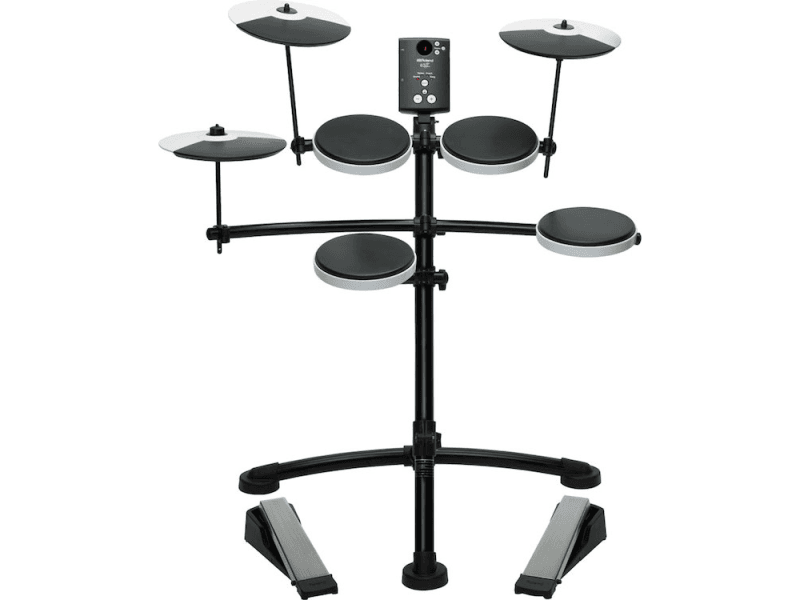 The TD-1DMK can continuously support your child as they develop the concentration, patience and physical strength that comes through regular playing. Whether you want to be a drum hero in a band or you just want to develop solid drumming skills, the TD-1DMK helps you get there by supporting the techniques learned in your tuition. The TD-1DMK faithfully responds to the subtle nuances of your playing – with every stick hit and all the dynamics detected and faithfully relayed, thanks to the fast processing and authentic acoustic sounds of the TD-1 module. And as you improve, the TD-1 module can keep up with you, reflecting your superior technique and expression. The dual-layer mesh heads for the snare and toms can be tension-adjusted and offer stronger stick resistance compared with other mesh heads, giving natural rebound and feel that’s as close as possible to the feel of playing acoustic drum heads. Kick pedal feel and rebound is also important for your drumming – so the TD-1DMK is compatible with your choice of kick pedal, including double-kick pedals, while the soft rubber pad absorbs the energy from the beater, for a natural feel, faithful rebound and quieter performance. If you used to play drums, you’ll remember how good it felt – whether the sheer physicality and expression of playing alone, or the enjoyment of collaborating with other musicians and nailing a song together. The TD-1DMK can help bring drums back into your life, whether you’re brushing up your skills or picking up where you left off. From onboard songs across a variety of genres, to connecting your smartphone to the module and playing along to your favorite tracks, the TD-1DMK lets you play along with music while you smooth out those rough edges. And if those edges are a little too rough, the quiet performance of the TD-1DMK and the option to use headphones lets you immerse yourself in the music without disturbing your family. The durable TD-1DMK is infused with legendary V-Drums reliability too, so you can play with confidence for years to come. And as your skills and ambitions grow, you can expand the TD-1DMK by adding an extra crash cymbal or even upgrading the sound module. Give yourself a break – start playing drums again with the TD-1DMK. Weigh - t17.8 kg, 39 lbs. 4 oz. *1 Kick pedal and drum throne are not included. *2 Specially designed for the TD-1 Double Mesh Kit, unsupported for using a rim-shot. *3 MDY-12 is additionally required for mounting a CY-5 on the stand. The TD-1K is not just fun to play by itself—it’s also a great way to make music with your computer. Included is a built-in USB-MIDI interface, making it simple to communicate with music software via just a USB cable, with no extra hardware needed. Maybe you’ll transfer your playing into your computer-based recording software, capturing a live drum feel in your latest masterpiece. Or perhaps you’ll use Roland’s free V-Drums Friend Jam series applications, which offer jam tracks, practice features, and the ability to compete with V-Drums users across the planet. For more in-depth education, the powerful DT-1 V-Drums Tutor provides a fun, dynamic platform for learning notation and essential drum techniques. Whatever application you chose, the TD-1K is a drum kit that lets you go places. Weight - 11.4 kg, 25 lbs. 3 oz.